Let me start by saying that I loved “Wild.” I loved the book. I loved the movie. I loved the way they captured many of the struggles and fears that hikers, especially solo female hikers, have while backpacking. And, it gave me a sincere appreciation for the fact that my toenails fell off on their own without having to rip them off. After returning from six months on the Appalachian Trail (A.T.), one of the questions I get a lot (after “How was it?” – a question that is impossible to answer in less than 45 minutes and without a 400-plus photo slideshow) is “What did you learn?” or “How did you grow as a person?” There are, indeed, a lot of things I learned. For example: porcupines will eat your shirt if you leave it out to dry on a bench at night. Most hikers carry at least one or two things they could do without, luxury items you might say. I learned that a shirt is not a luxury item. A shirt is something you need. I also definitely grew as a person. Confidence abounds after keeping yourself alive in the woods for months at a time. However, I have found that people seem to be looking for a more of a “Wild” answer. Now, many people who spend time on the Trail do have “Wild” experiences. The Trail is a great place to heal, grow, and learn about yourself. I have been blessed to spend more than 10 years hiking and working on the Trail. It has changed me, but those changes have been slower, more gradual. So this fall, making my way from Katahdin to Springer, my Trail experience was more of a vacation than a spiritual journey. That’s to say, while every so often the thought, “I bet people think I’m contemplating the meaning of life right now” would cross my mind, the actual meaning of life rarely did. The expectation that spending so much time in the woods will lead to spiritual musings, an understanding of who I really am (other than a very hungry hiker), and an enlightened sense of self, is so pervasive, though, that I’d like to give you a taste of what really happens in the brain of a long distance hiker. I found that sometimes, when I’m hiking . . . 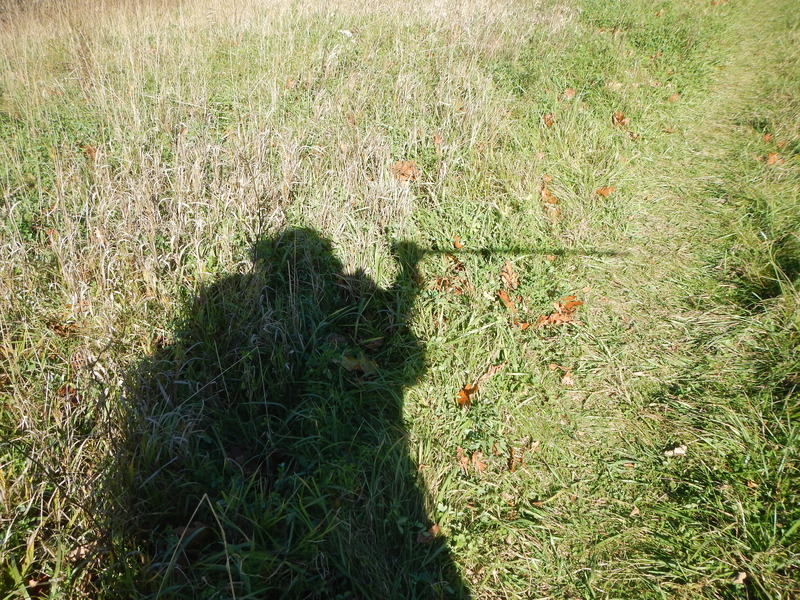 I use my trekking poles as a microphone and dance down the Trail. I throw my snot bandana over my shoulder and pretend it’s a cape and I’m a super-hero flying down the Trail. I pretend I’m a NASCAR driver banking on the downhill turns (no one goes fast on uphill turns). But only on the left turns – on the right turns, I pretend I’m a Formula One Driver. I pretend the ground is lava, and I have to jump from rock to rock in order not to burn up. I pretend that I am one of the elephants from Salvador Dali’s paintings, and my trekking poles are my long spindly front legs. Then I take giant tromping steps. I wonder if I can climb that, then I check to see if I am right. I wonder if I have been hiking for too long . . . nah! From idly dreaming about long hiking trips to working seasonally, then full-time for the Appalachian Trail Conservancy, Ellen is excited that she had the opportunity to turn her on-again, off-again flirtation with the Trail into a fully committed relationship this past summer and fall when she spent six months hiking more than 1,700 miles of the AT. With a few miles left to go, Ellen is happy to say that she is not done, and is still hiking the Trail (albeit not on the Trail these days). Stay tuned for the full story and the rest of Ellen’s hike in a future issue of A.T. Journeys, and in the meantime, check out her blog here.